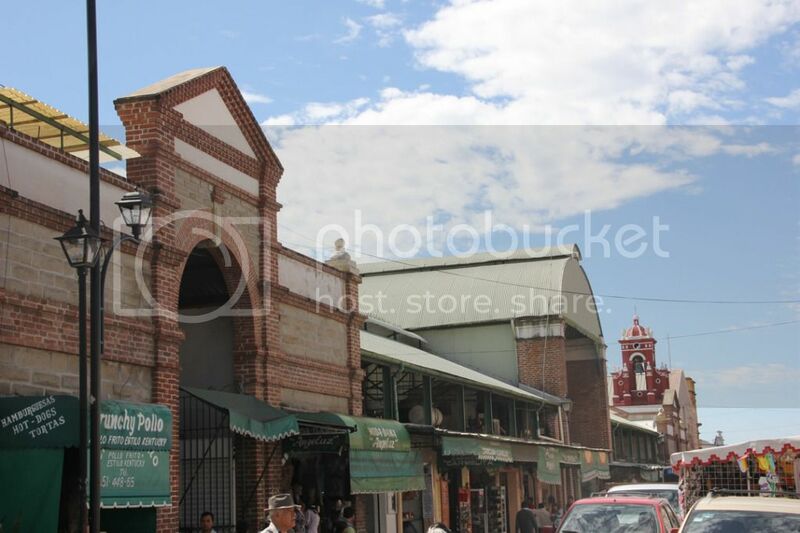 The Oaxacan historical district consists on a regular grid of 100x100m squares that sprawls down to the busy peripheral rings, stretching as far up as the lush hills of San Felipe and limited by the local college on its Eastern side. Every Wednesday I walk from the square where I live towards a square that I love, exactly 650m, or five blocks, to my weekly solace, hidden in the entrails of an early 20th century brick construction. Notice the "crunchy pollo" sign at the corner, followed by "Kentucky Style". Past each of the entrances lays a tall, open space, crowded by some of the more popular businesses and hoards of street vendors, proudly displaying their merchandise out of makeshift posts, wooden boxes and plastic bags. Their announcements are bold, sharp and at times pushy –asking right away what amount you will take, without any ceremonious greeting-; yet, deep within the walls of this lively building and hidden in the darkest corner, you will find unique cuisine that runs true to Mexico’s heartbeat. Right behind the camera sits a man whose job is to typewrite things. On a real typewriter. Right after the main halls all trace of sunlight disappears, leaving only the buzz and glimmer or fluorescent lighting. The air smells strongly of spice and starched clothing as I walk through endless hallways lined with purses and candies. Some of these sellers recognize me from previous times, and wave timidly at the squinty, black-on-black stranger holding a big camera in a quiet, mildly threatening fashion. Just having some candy... the dog seems to want some as well! Traditional, nut-based confections, as well as some handmade marzipan (left). Despite this market resembling Kowloon City (for those who remember) more than anything, there is a healthy sense of normalcy. Customers line up for an order of Tamales, a scoop of almonds, a bag of sweet marzipan or a bowl of foamy tejate, the Mixtecan drink of the gods, and the energizing boost that brings me to the market every week. A caramel-skinned woman pours and re-pours the dark liquid in an almost hypnotic trance, blending it with the maize and cacahuaxochitl (cocoa flower) mix at the top. As soon as you order, you get some sweet syrup and your choice of cup or glass. The view from the Tejate post: moles of all kinds (bottom) and miscellaneous nuts. My coworkers here in Oaxaca have recommended me many foods to taste during my stay in Oaxaca. In these last few weeks I have had the honor to be introduced to some of the most unique foods in Mexico, in some instances through interesting anecdotes that have made these delights, well, even more delightful. Bright colors, despite the lack of natural light, are a complete must! As a hostel receptionist, I can say that most of our clientele are local businessmen. One of them, a former assistant to my boss, plopped three bags on my desk on fine afternoon. “Try them! Each bag is a different kind”, he said. After asking about the crunchy stuff before me, he replied: “Chapulines –grasshoppers–. Ever had one?”. I instantly grabbed one and shoved into my mouth, not giving my sense of Western “decency” a chance to react. And it was good. A few samples from each bag and a long conversation later, I found out there are three kinds of seasonings for fried grasshopper cooking: spicy pepper, garlic and salt-and-pepper. Oaxaca has a rich tradition with cooking bugs, from mammoth “chicatana” ants to the iconic maguey worms that distinguish mescal (agave liquor) from tequila, two drinks that are often mistaken for each other. Guess what these little crunchy things are! Chapulines, or grasshoppers, ready to eat straight out of the mound. Mezcal has curative properties: sore throats, colds and headaches, amongst others. Two of the most popular Oaxacan foods are quesillo and mole, recognized worldwide for their common use in Mexican cuisine. On the one hand, quesillo, or string cheese, is probably one of the few kinds that you will see wrapped into a ball upon purchase; it has a soft texture and mildly sour flavor. It tears similarly to mozzarella and it is most commonly melted on top of meat, enchiladas, empanadas and tlayudas –tortillas served with a rich mix of ingredients in a similar fashion to pizza. And talking about pizza: you will see several businesses offering it the historic district, but do not take it as an insult to your cultural sensitivity; pizza is eaten fairly often by the locals, and prepared by the small –but very dedicated– community of Italian immigrants in town. Mole, on the other hand, is the Mexican sauce by default; it offers a myriad of ingredients that change significantly depending on its color: from cocoa in “black” mole to miscellaneous herbs and chili in the “green” type. Oaxaca is dubbed “The Land of the Seven Moles”, and with reason: at the central market you will find all possible combinations and flavors, sold in big tubs of paste and bags of powder. Casually rolling some cheese for a customer. Special mentions go to the native cocoa and coffee products, grown locally and a must-have if ever stopping by Oaxaca. In the realm of desserts, the most original ones are the Nieve de Tuna (cactus pear sherbet), Leche Quemada (burnt milk) and amarath-based confections that are guaranteed to surprise the Western visitor. From the pre-Hispanic recipe for Tejate to the 1940’s mezcal worm gimmick, the culinary capital of Mexico has many delights to offer –many a time linked to an interesting story! Chocolate confections made out of local cocoa plants.